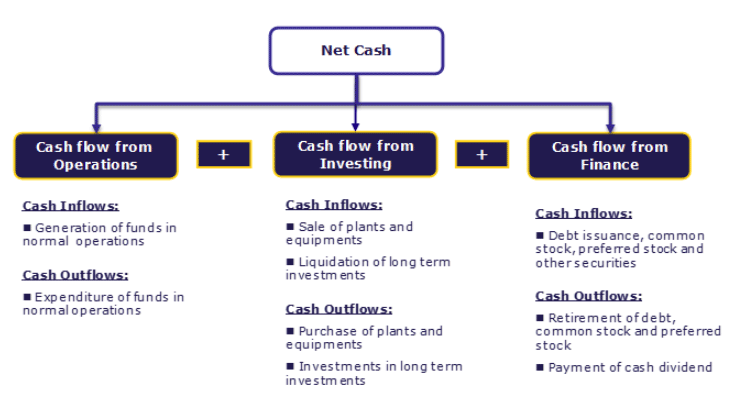 What is Statement of Cash Flows? Cash flow Statement is one of the top 3 Financial Statements that helps us understand the flow of cash in the business and how it has moved in and out of the company in a particular period. Cash Flow from Investment Activities – It represents cash inflows/outflows related to investment in the business including Property, Plant and Equipment. It is the cash flow generated from the operation of the business. This cash flow is generated from principal revenue generation activities of the company. The primary components of this statement of cash flow include accounts receivables, inventory, depreciation, and accounts payable. Statement of Cash flows from operating activities for Samsung is cash flow from the business of manufacturing and sale of Mobiles, TV’s, refrigerators and other electronic activities which are its mainstream operating activities and not the cash flow from some sale of investments. Similarly, cash flows from operating activities of Coal India is the cash flows from generation and sale of coal and not from the sale of the old computers lying in its office. 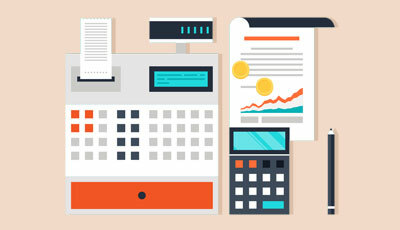 Generally net income (appearing in profit and loss account) is considered as primary source of cash flow from operating activities and the same is adjusted with changes in current assets and liabilities, non-cash expenses and other items associated with investing and financing activities like dividend, interest on debentures, sale and purchase of assets, extraordinary income or expenses etc. Let us now have a look at the Statement of Cash flow (Operating Activities) of Colgate. 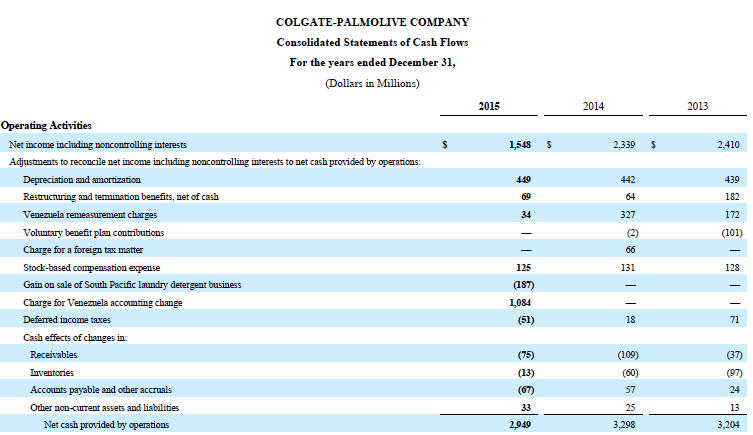 As we note from the above statement of cash flow that Colgate’s Net Income in 2015 was $1,548 million. Cash flow from operations has decreased as compared to the previous periods (2013 and 2014). Also, note that there was Charge for Venezuela accounting change of $1084 million added in 2015. Cash Flow from Investments represents the cash flows from the acquisition or disposal of company long term investments such as investments in subsidiaries and associates, plant & equipment, fixed assets. If Coca Cola is planning to build a bottling plant in India with an investment of $ 10Mn, the cash outflow of $10Mn is cash outflow from investment activities. We ntoe from the above statement of cash flow that there is a cash outflow of -685 million in 2015 and -859 million in 2014. Colgate’s investment in buying core assets was a cash outflow of -691 million in 2015 as compared to -757 million in 2014.
Colgate received $221 million from proceeds from the sale of South Pacific laundry detergent business. It shows the cash inflows and outflows from transactions with providers of financing to the company like banks, shareholders and promoters. Let’s take a statement of cash flow (financing) example. A company issued shares of $ 1,50,000 and take a loan from the bank for $30,000 Dividends paid is $ 5,000 interest paid is $2,000. Colgate has a stable dividend policy. They paid -1,493 million in 2015 and -1446 million in 2014. As a part of its Share repurchase program, Colgate buys back shares at regular intervals. In 2015, Colgate purchased $1551 million worth of shares. 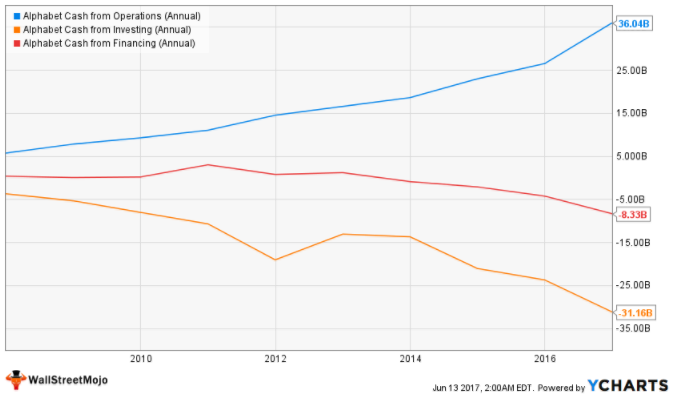 Cash Flow From Operations – Google’s CFO consists of advertising revenues, sales of apps, in-app purchases, digital and hardware products, licensing arrangements as well as fees from Google Cloud Services. 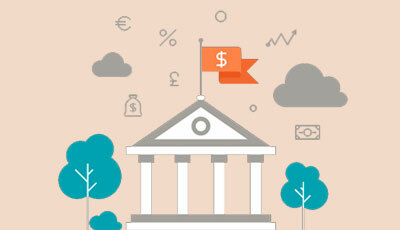 Cash Flow From Investing Activities – It consists of purchases of marketable securities, cash collateral paid related to securities lending and spends related to acquisitions. 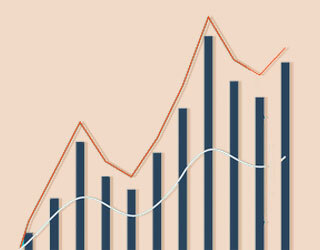 Cash Flow from Financing Activities – It primarily included issuance of debt, debt repayments, repurchases of capital stock and net payments related to stock-based award activities. Cash Flow from Operations – It consists of cash received from consumer, seller, developer, enterprise, and content creator customers, advertising agreements, and co-branded credit card agreements. 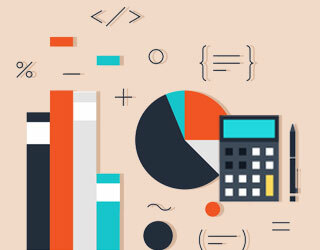 Cash Flow from Investing –consists of cash capital expenditures, including leasehold improvements, internal-use software and website development costs, cash outlays for acquisitions, investments in other companies and intellectual property rights, and purchases, sales, and maturities of marketable securities. Cash Flow from Financing Activities – Consists of Principal repayment of long-term debt and obligations related to capital and financial leases. Cash Flow from Operations – Consists of cash generated form Software-as-a-Service (SaaS) cloud content management platform. 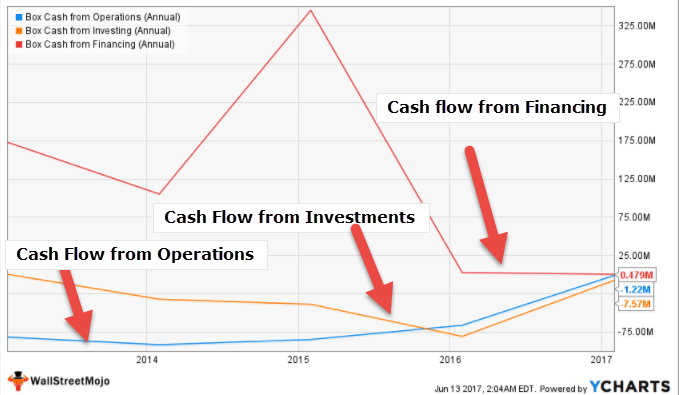 Unlike the other two examples of Amazon and Google, Box Statement of Cash Flow from Operations is weak due to continued losses over the years. Cash Flow from Investing Activities – Box Cash Flow from Investing activities was at -$7.57 million in 2016 as compared to -$80.86 million in 2015. This was primarily due to reduced capital expenditure in the core business. 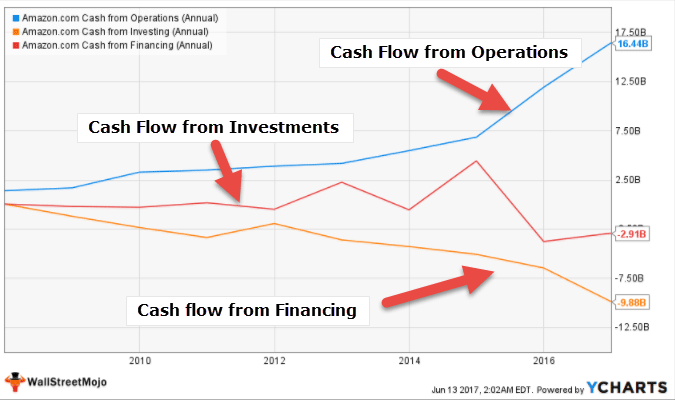 Cash flow from Financing Activities – Box Cash Flow from Financing Activities has shown a variable trend. In 2015, Box came up with its IPO and therefore its Cash Flow from Financing increased to $345.45 million in 2015. Prior to its IPO, Box was financed by Private Equity Investors. 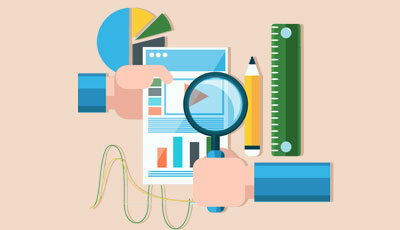 What is the Purpose of Cash Flow Statements? 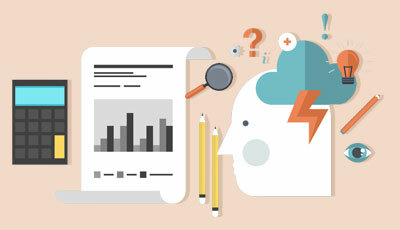 How to do Cash Flow Analysis?